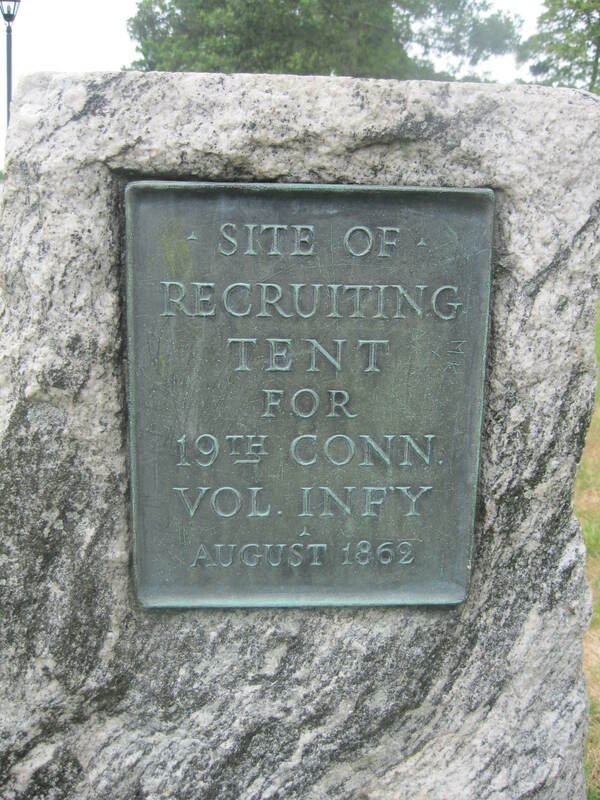 Marker identifying the location of the recruiting tent for the 19th Connecticut Infantry on the Litchfield Green. On April 15, 1861 – within days of learning of the Confederate firing on Fort Sumter – President Abraham Lincoln issued issued a call for 75,000 volunteers to serve for 90 days in order to put down the rebellion. Much has been made of this as evidence that Lincoln perhaps had his head in the sand or was ignorant about the realities of the manpower needed to win the Civil War; however, under the existing Militia Act, the 75,000 men were all that Lincoln was legally allowed to call out. Regardless of the technicalities of the law, Northern enlistment offices were overrun by volunteers – in fact, some men were actually sent home. The battles at Bull Run, Shiloh, and on the Virginia peninsula made it clear that significantly more Union troops would be necessary to vanquish the Confederacy. 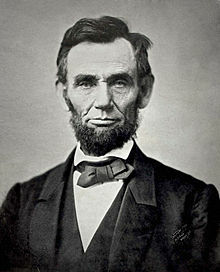 Therefore, in July 1862, Lincoln issued a call for 300,000 additional volunteers to serve for three years. From Mississippi’s winding stream and from New England’s shore. We dare not look behind us but steadfastly before. We are coming, Father Abraham, 300,000 more! We are coming Father Abraham, 300,000 more! 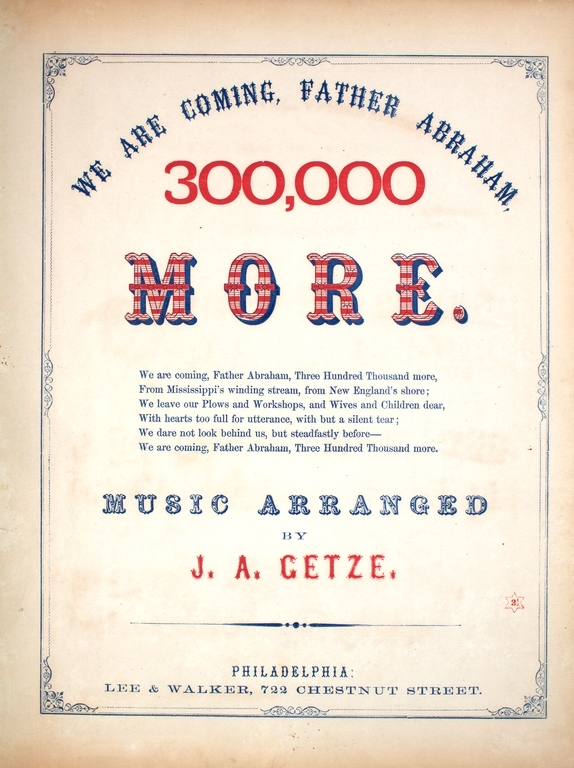 As patriotic songs alone did not ensure the volunteers the Union army needed, the Lincoln Administration assigned each state a quota for the number of volunteers to be raised. Connecticut was thus required to raise 7,153 men for the Union cause. The state in turn assigned quotas to each town based upon population and number of men already in the service; if these quotas weren’t met, a state draft would follow. 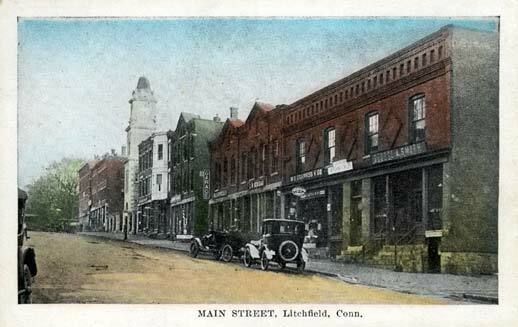 Based upon the calculations, Litchfield needed to raise 48 men in August 1862. A recruiting tent in New York’s City Hall Park. 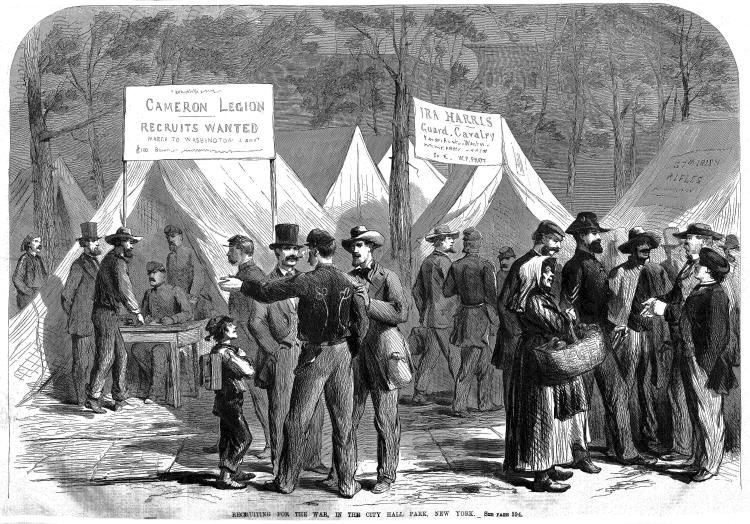 Almost immediately, a recruiting tent appeared on the Litchfield green, with A. B. Shumway supervising the operation from an office at the Litchfield Enquirer. 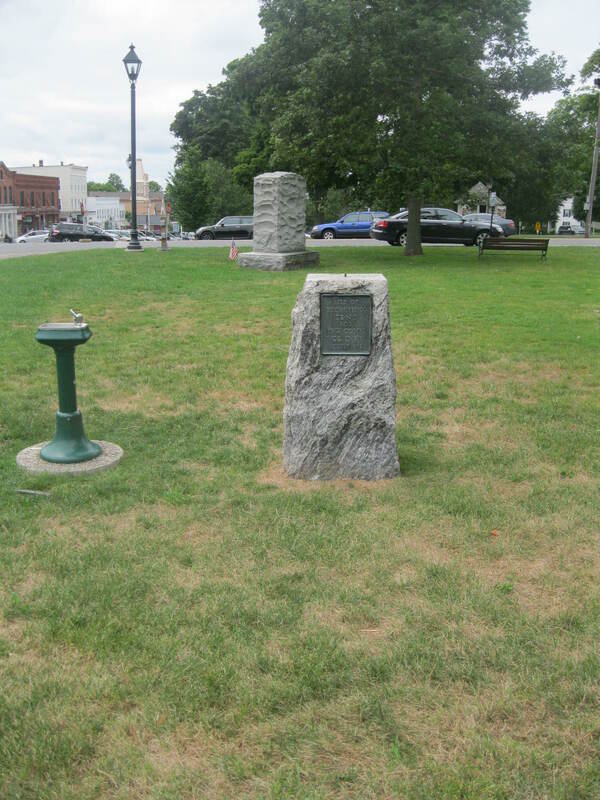 By July 25th, Shumway could state that he had “already enlisted several men, and expects to enlist many more before the regiment goes into camp.” The newspaper reported on August 7th that “Litchfield will fill up its quota during this week. The work goes bravely on, and the Regiment will be full, we trust, before the 20th of August.” Another article stated that “recruiting is going on briskly in Litchfield. Our people are becoming aroused to the true appreciation of their duty in these times. The prospect of an early draft creates excitement. (Draftees received no bonus) We shall take our full town quota in the regiment into camp as soon as it is formed.” The paper went a step further, predicting that Litchfield and Goshen alone would fill an entire company of 100 men. The enlistees from Litchfield and across the county reported to Camp Dutton on Litchfield’s Chestnut Hill (a site that will be explored in a later post). 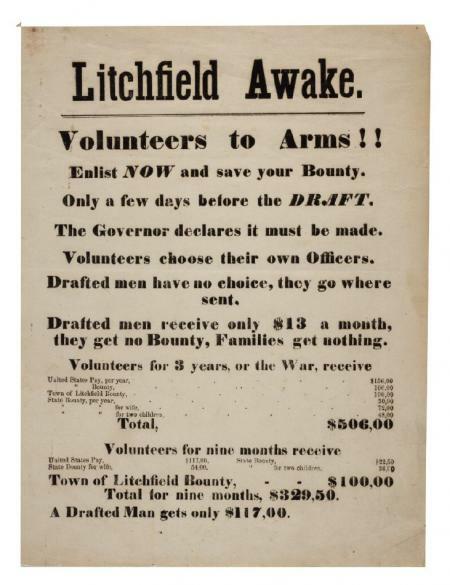 Whether its citizens were motivated by patriotism, financial incentive, or fear of being drafted, Litchfield exceeded its quota, sending nearly 70 men off to war in the summer of 1862, nearly all of them in the 19th Connecticut Infantry, which would gain fame on fields including Cold Harbor as the Second Connecticut Heavy Artillery. Questions remain about this marker. 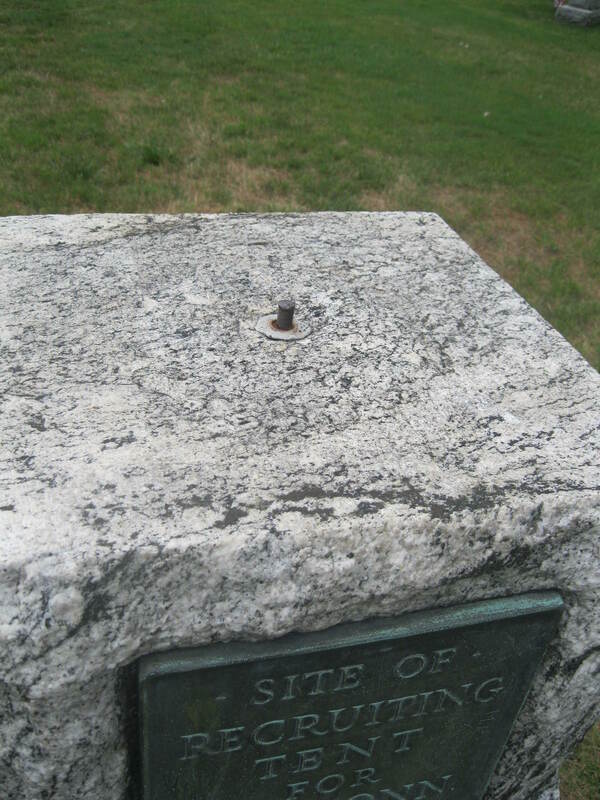 It appears that at one time something was attached to the top of this marker. What was it? When was this marker erected? Who put it up – the Village Improvement Society? The 2nd Connecticut Heavy Artillery Veterans’ Association? More research is needed/ Stay tuned! This entry was posted in Architecture, History and tagged Civil War, Litchfield, monuments by pvermily. Bookmark the permalink.